This is the first year in the history of my life when there will be not be a single relative who lives outside of my house celebrating Christmas Eve or Christmas Day with me. Nada. No One. Zilch. No invitations were extended our way, and none from us were accepted. I'm not expecting the "We love you so much and hate that we can't see you this year" phone calls either. They won't come. They never have. Don't feel sorry for me, though. I'm looking at this Christmas with a new set of priorities. I'm considering it a gift, really. It's the gift that keeps on giving because this is the year that I have decided to finally let go. I have always been jealous of your Christmas. I was jealous because your house is full of bear hugs for relatives you've missed all year. I was jealous of how you linger at the table over coffee while reminiscing about the days when polyester pant suits and bee hive hairdo's were all the rage. I was jealous of how your heart swells when you look around your crowded, messy house and close your eyes for that brief moment while thanking the powers that be for your blessings. Most of all, I was jealous that in your family, gathering at Christmas is a time-honored tradition that no one wants to miss. That all changed a few months ago, though. On a blistering summer afternoon, I found my car pulling into the graveyard where my parents are buried. I never go there. Cemeteries are dreadful places that bring me no peace. However, as I stood there staring at the names of my Mama and Daddy etched into that stone, I had an epiphany. It was time to move forward because the years are never guaranteed. I have always said that you don't have to like to the people you're related to, but now it is time to cut them loose. I know my mom would hate that our family is irrevocably broken, but deep in her heart she would understand why. You shouldn't have to beg for love...and I won't any more. So, this Christmas as families are loading up their plates with turkey and trimmings, washing down their pumpkin pie with egg nog, and laughing with delight at a bounty of gifts, I will be thankful that there are at least a handful of people who truly love me and want me around. These are folks who don't need me to beg and cajole for attention and companionship. This is MY family, MY people, the four of us, and to hell with the rest of the self-absorbed world. 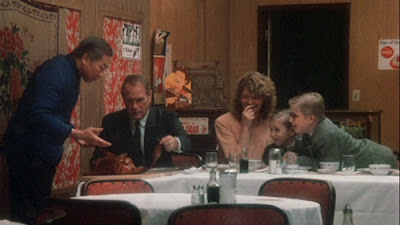 We're making a new tradition this year, taking a cue from Ralphie and the Parker's from "A Christmas Story". We'll dress in our Sunday best and head out for Chinese food this year. I finally realized that with my real family at my side, who needs a sweet potato casserole served with tension and drama when you can have peace in your heart and lo mein noodles. And...if we're lucky...maybe they will serenade us, too. Fa, ra, ra, ra, ra, ra, ra, ra, ra!! For the record, I love you. Fa ra ra ra ra, ra ra ra ra. Good for you! Who needs a bunch of sad sacks around at Christmas? You will be less stressed anyway and really enjoy yourself and your kids. I am having the same Christmas as you. Just the 4 of us, and that's how I like it. My parents beg us to make the drive to their house (not that they are incapable of coming to ours), but I can't see putting our 4 (newly potty trained) and 7 year old kids with autism through the 9 hour drive. It's a 6 hour drive sans children. With the exception of last year's 10 days of holiday hell, we have celebrated Christmas as our little family, in our home, without guests for 8 years now. I LOVE it. No pressure. We spend the day in our pajamas. Nobody telling me how to raise/discipline/religiously educate my kids. Just the 4 of us in all our unkempt glory. We might get dressed before dinner. But we might not. It's a tradition I plan to carry on until my kids marry. I love our Christmas for 4. This is exactly how I feel about my family. I let go of them after my grandmother passed away and there were no more ties to hold me there. Luckily, my fiancee has a great, loving family that I get the privilege of spending time with over the holidays, but when they are gone, it will be just the four of us as well. Congratulations on the peace you have found, and Merry Christmas to you and those you love. I hear ya! I definitely understand the need to say away from drama during the holidays. Over the years we have also opted to spend our holiday with just us 4. I love it and at the same time have enjoyed spending Christmas Eve. with our amazing friends who show us more consideration than my parents, sister, aunts, uncles etc. Best Christmas ever. When you let go and accept. Love this post and merry Christmas! I'm SO glad you wrote this one! This is totally me this year too! I've always felt like the black sheep and with what has happened earlier this year (a sister blowout)I have finally come to my senses (I can't believe it took 20 years!). I will not do all the driving and calling this year. My new mantra is 'if you don't care about me then I CERTAINLY don't care about YOU!" We're doing our own Christmas this year and we're doing it OUR way. YAY US! This is so relevant and I LOVE it. My mom passed away in January and my stepfather of 31 years remarried last month, renovated their house, and left barely any trace of my mom. To say the least, it's been a rough year. I decided that while we will visit Christmas eve day, Christmas Eve will be reserved for my boyfriend of 2 years and his kids, and Christmas Eve just my kids and I will sleep here at home and we will build our own new tradition. Since they are truly my family, they are the ones who REALLY matter. I guess at some point we all break free of the usual and forge our own. I'm looking forward to it. I hope that yours is great. MERRY CHRISTMAS and love to you all!! Wow. you have gained a fresh perspective and no doubt will gain a better future. I didn't think I could love you more but I DO!! I hope you and your family have the best damn Christmas Ever and may the New Year bring blessings to you ten-fold. If Christmas brings tension, burt feelings, pride, or anger, then who needs to be around those who create that feeling? You would be welcome at our house for the holiday! Surround yourself with friends who make you happy and bring you joy. And make your own traditions and good cheer. Letting go of past tension is very liberating. Cheers to you and yours and I want me some chinese food this christmas too!!! Peace! Thank you so much for this. I had to spend Christmas with my in-laws this year but it was our last. After everything that has happened in the past year and a half my husband and I are cutting them loose. We are starting the 2012 year off fresh and it will be without the drama and petty attitudes from those people. What you wrote has confirmed to me that we are doing the right thing. I hope you have a wonderful New Year. I envy your Christmas without all of the drama!